When it comes to volunteering, your experience counts. Your life experience, commitment and maturity are highly valued by many charities and community organisations. You may prefer to speak to someone face-to-face to help you search for volunteering opportunities. 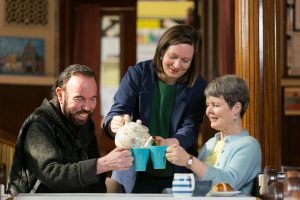 If so, you should come in to our regular monthly Experience Counts Coffee Mornings, to learn about volunteering opportunities available in Dublin City. Meet other volunteers, get some support for your search and share your volunteering stories. No need to register, simply join us at 11am. Free tea, coffee and light refreshments are provided. It is a few minutes walk from O’Connell Street or right across from the Luas Stop on Abbey Street. The closest parking is available in the Irish Life Mall. Agenda: We meet at 11am for tea/coffee and refreshments, followed up by a short talk by a guest organisation. Each month we invite a charitable organisation to come in and introduce their volunteering opportunities, usually around 11.30am. Afterwards, there is plenty of time to network and/or chat to one of the Volunteer Centre staff. You can volunteer when you are in receipt of a state pension (either contributory or non-contributory). Those receiving Carer’s Allowance or Carer’s Benefit, you can do a maximum of 15 hours per week of voluntary work and before you start working as a volunteer, you must get permission from the Carer’s Allowance or Carer’s Benefit Section in the Departments of Social Protection. Those receiving Jobseeker’s Allowance or Jobseeker’s Benefit must apply under the voluntary work option before they start any voluntary work and get permission from a Deciding Officer at the Intreo Centre. It is required to submit an application form (VW1), which is available from Intreo Centres or Social Welfare Branch Offices or downloadable HERE. Those receiving Invalidity Pension cannot do more than 19.5 hours of voluntary work per week. Those in receipt of Illness Benefit or Disability Allowance are not limited on the number of hours per week they can work unpaid as a volunteer. Volunteering should not cost you anything, and we encourage organisations to reimburse expenses. Whilst many can offer travel and/or lunch expenses, that may not be possible for others, especially volunteer-led community projects. It is best to check with the organisations beforehand. Will I have to be Garda Vetted? You will be required to undergo the Garda Vetting process if your volunteering will involve regular contact with children (under 18’s) or vulnerable adults. All the organisations that work with children and/or vulnerable adults are obliged by law to Garda Vet all the staff and volunteers before they engage in their activities. However, Garda Vetting may not be required for once-off events or engagements, so check with the organisation beforehand if you are not sure. Can I go on holidays or take time off? Sometimes you may like to take a break from volunteering or even take a longer holiday. It is absolutely fine, as long as you give the organisation enough notice. You can still take up a regular volunteering commitment and arrange it around your other plans.